Leicester City Ladies AGM will be held on Thursday 25th May in the Rowley Suite of the King Power Stadium with a 730pm start. Prior to the AGM the Junior section will be holding a meeting with a 630pm start. Congratulations to Leicester City Ladies Under 12s 66 for securing the League Cup with a 1-0 victory in the final against Cosby Ravens. 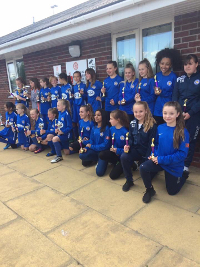 Leicester City Ladies Under 12s Fosse were at the Cup Final to be presented with the trophy and their medal for winning the League. 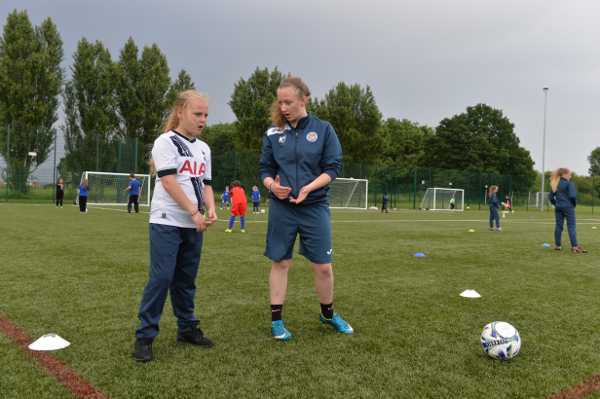 It was a successful evening for Leicester City Ladies when the results of the 2017 FA Community Awards for Leicestershire were announced. Fun filled 3 day football camp for Girls aged 4-13. Tuesday 30th and Wednesday 31st May. Ages 4-7 between 10am and Midday costing £5 per morning. Ages 8-13 between 10am and 3pm costing £10 for the day. Places are limited please contact Sue at secretary@lclfc.co.uk or call 07714088838 to secure a place. All sessions are led by a FA Level 3 Coach assisted by FA Qualified Coaches. Please provide your child with shin pads, football kit, astro turf trainers or plastic studded boots.